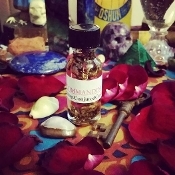 Conjured Cardea offers hand-made spiritual supplies with the authenticity that we practitioners crave. 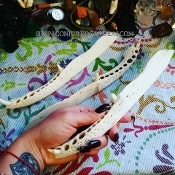 Vodou, Hoodoo, Santeria, Folk Magic, Pagan, Spiritualist and all Craft practitioners will find a full line of hand-crafted items for daily use and celebration. I also offer a complete line of rootwork services such as vigils, workings and novenas. These are completely customized and performed on your behalf, offering you a comprehensive approach in reaching your goals. Simply click on the "Contact Moma Sarah" button for your FREE consultation and product recommendations. I ship as quickly as I can, 15 business days to process most orders, to anywhere in the world and all major credit cards and Paypal are accepted. Each order is gift wrapped and I lagniappe! Lagniappe is the gulf coast practice of receiving a gift with purchase. Conjured Cardea has reached over 100,000 sales, with clients in nearly 100 countries, in 7 years. Feel free to contact me with any questions you may have regarding myself, my work or my items. I look forward to serving you!